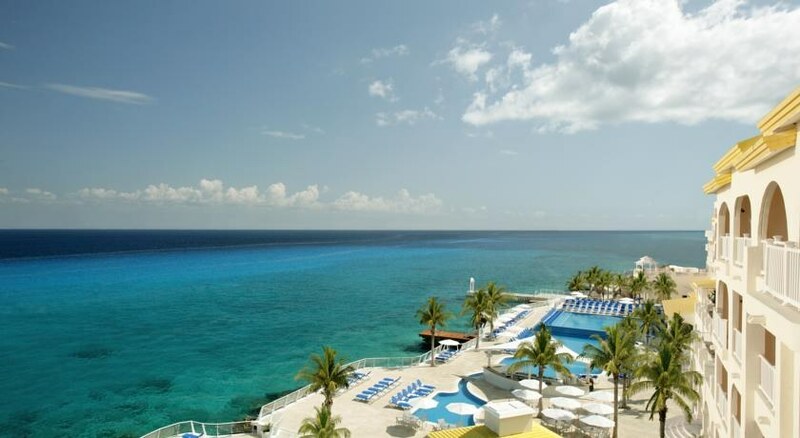 Boasting an exceptional oceanfront location with luxurious suites overlooking the Caribbean Sea, Cozumel Palace is a paradise for water sports lovers and offers myriad activities. Not only is the resort set on the seafront, its right next to the world’s second-biggest coral reef, making it a must-visit for snorkelling and diving fans. At the resort, guests can choose to enjoy a meal from one of the 4 on-site restaurants and proceed to catch up with their fitness regime at the fitness centre. Guests can also spend the afternoon by one of the resort’s swimming pools, or simply admire the seascape from your room’s balcony. After exploring the ocean of fun at the resort, guests can seep into the deep comfort of the rooms or get pampered at the spa. From couples looking to have a romantic island retreat, to families wanting to spend fun time together, Cozumel Palace has something in store for everyone. 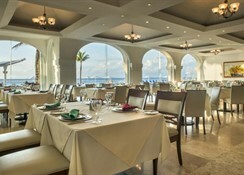 Located on the waterfront, Cozumel Palace sits along a rocky portion of coastline just outside the town of San Miguel. Lying within walking distance of Cozumel Maritime Terminal, the resort keeps its guests connected with the exciting attractions of the surrounding area. The Dolphinarium is within a 5-minute walk of Cozumel Palace while Palacio Municipal lies within a 15-minute stroll. Stingray Beach and Plaza Punta Langosta are also a short walk from this resort and the Chankanaab National Park is situated at a 15-minute drive. 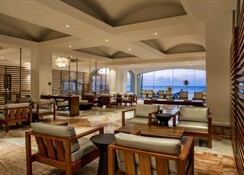 The resort even offers convenient access to Cozumel International Airport that lies only 3 km away. The Stunning location of the resort is complemented with 169 luxurious suites classified in 3 categories: Junior Suite, Concierge Level and Loft Suites, all facing the ocean. Besides featuring satellite TV, coffee maker, bathrobes and slippers, laptop safe, ironing set, telephone and individually controlled air conditioning, all suites offer a spacious seating area and a double whirlpool ideal for relaxing after a day of exploring. 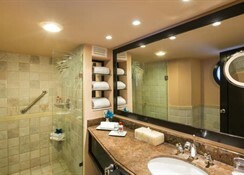 Also, each Cozumel Palace guest room offers convenient amenities including Wi-Fi, purified water, in-room wine, liquor dispenser containing whiskey, tequila, rum and vodka and a mini-bar containing sodas, bottled water, juices and domestic beer. Finally, to give its guests that luxury edge, all rooms are fitted with a hot tub and every room’s personal balcony is kitted out with a hammock allowing guests to enjoy refreshing ocean breezes of the Caribbean waters in style. 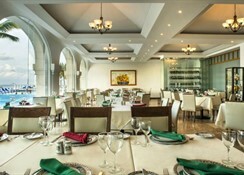 Food-wise, guests at the Cozumel Palace are presented with a choice between 4 on-site restaurants that offer a variety of cuisine choices including American, Mexican, Italian and Pan-Asian. 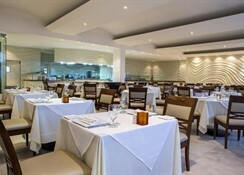 The Turquesa puts on breakfast, lunch and an Italian à la carte dinner; Mo-Mo-No-Ha-Na serves Asian food à la carte, while traditional Mexican dishes are available at Bugambilias restaurant. To enjoy snacks throughout the day (including pizzas from an outdoor log-fired oven) or enjoy an alfresco dinner buffet on the seafront terrace, guests can stop by the Flamingos swim-up bar and grill. 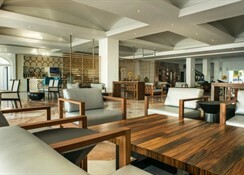 Apart from the restaurants, the resort’s bars serve savoury treats along with drinks of your choice where to help you relax in the evening. Cozumel Palace puts together a variety of entertaining activities to make sure that its guests make the best of their holiday. Guests can choose to laze away their day at the resort’s infinity pool set over two levels; with a swim-up bar. As the second largest reef in the world, the Palancar coral reef is close by, guests can go on the ultimate scuba or snorkelling adventure. For an adventure of a lifetime, holidaymakers can interact with fun-loving dolphins at the dolphinarium. To help guests relax after a day full of fun activities, the resort provides excellent spa treatments while the little ones can enjoy at the separate kids’ pool and playroom. If all of that is not enough, guests can keep an eye out for the daily and nightly activities including kids’ club and live performances for that special memorable experience. The hotel also provides Resort Credit of $1,500 USD on every booking for 5 nights that can be used by guests for spa and beauty salon treatments, golf outings, tours, romantic dinners and lots more.